It wanted something that could operate close to shore, attacking land targets and providing support for ground troops. Then came the conflict in landlocked Afghanistan. BRUNSWICK — To those who kept a close eye on the development of the Navy’s futuristic, next-generation destroyers, the Zumwalt-class program has been a disappointment to put it mildly. In the early 2000s, the Navy proposed building 32 highly advanced stealth destroyers at Bath Iron Works, giving the shipyard’s workforce hope for years of work to come. But as the years wore on, the number of ships ordered was slashed. And then slashed again. Ultimately, the Navy ordered just three ships – the second of which the Navy recently commissioned in San Diego. With the Zumwalts now nearing the end of their brief production line, the Navy is tasked with incorporating them into its strategy – a difficult task given that the Zumwalts were built for a mission the Navy no longer views as a priority. With the USS Zumwalt, the lead ship of the class, not expected to be deployed until 2021, it remains to be seen whether the destroyers will be an effective tool in the Navy’s arsenal – or an expensive cautionary tale. 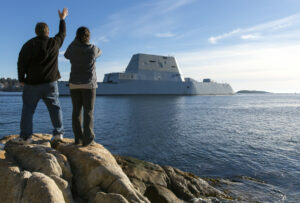 Bath Iron Works declined to comment on how Zumwalt destroyers will be ussed or decisions made by the Navy. In some ways, the Zumwalt can be seen as a casualty of the uncertainty facing the military following the end of the Cold War. With the fall of the Berlin Wall in the late 1980s, the Navy tried to pivot from the Cold War mentality that informed the design of other ships in the fleet. What it wanted was a destroyer built for conflicts in the 21st century – but what would those conflicts look like? After the Cold War, the Navy envisioned its Zumwalt destroyers as sleek vessels to aid ground forces close to shore. But they didn’t fit the military demands of the Iraq and Afghanistan wars, and the Navy still struggles to justify them. “There was kind of this wholesale view that the military was designed to fight the Cold War and we weren’t equipped now for the 21st century,” explained Eric Wertheim, an expert on naval affairs at the U.S. Naval Institute. The Navy believed the most important conflicts of the new century would take place on land, Wertheim said, and the Navy needed tools designed to support ground forces from the sea. As the Navy began developing its next destroyer, it wanted something that could operate close to shore, attacking land targets and providing support for military personnel on the ground. The Zumwalts were tailor-made for this mission, with a stealth design allowing the ships to sneak in close to shore to support military operations on land. However, in the wake of 9/11 and the invasions of Afghanistan and Iraq, that perception of what future conflicts would look like began to unwind. Though designed to strike land-based targets, the Zumwalts would be useless in the conflict in landlocked Afghanistan. While they could theoretically strike some targets in Iraq, their impact would be minimal. The Navy had made some assumptions about what their role in a post-Cold War world would look like, and they weren’t panning out. For Hooper, this change in focus for the Zumwalt led to confusion about exactly what the destroyer was supposed to be. As the Navy became more ambitious in integrating new technologies into the design, Hooper said the justification and purpose for the ship became more confused. For Hooper, that confusion affected nearly every feature of the ship. Even the advanced gun systems were flawed. The weapons were intended to bombard land targets in support of troops on shore. But in order to lay down effective fire, the guns needed fairly large magazines, explained Hooper, and the gun system magazines were relatively small, compromising that mission. Through the mid-2000s, work on the Zumwalt continued even as the justification for its existence was starting to crumble. In 2008, the Navy bit the bullet and made an about-face. Navy officials told Congress they no longer needed dozens of Zumwalts. Instead, they would build just two, and the Navy would relaunch production of the more traditional Arleigh Burke-class destroyers, which have been in service since the early 1990s. 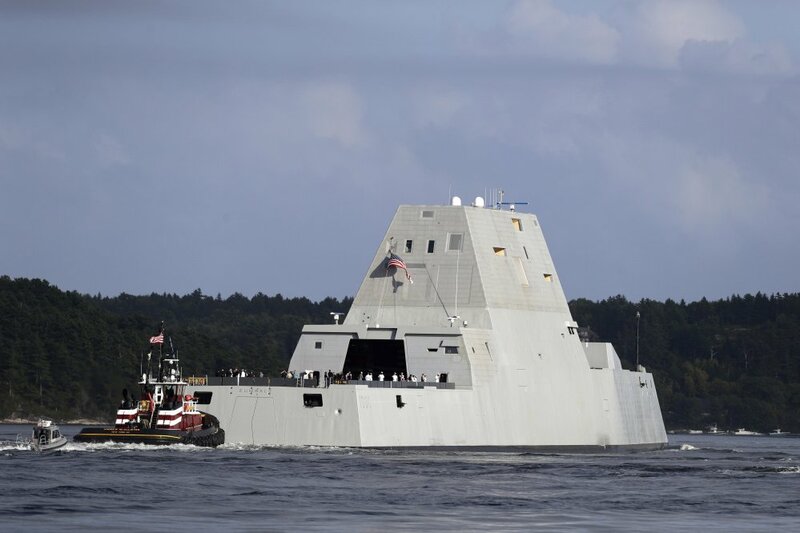 The Navy’s decision to eventually order a third Zumwalt did little to soften the impact the drastic shift in priorities would have on Bath Iron Works, which the Navy contracted to build all three destroyers but had hoped to build far more. “In the years that led up to that contract, we worked to change the shipyard from DDG 51 (Arleigh Burke-class) construction to DDG 1000 (Zumwalt-class) construction. We changed the tools, our design practices, the way we planned the ship and the production work labor,” Bath Iron Works President Dirk Lesko told an audience at a local event in October 2018. The shipyard reconfigured its operations for the new destroyers, only for the Navy to slash its order from 32 to three. As the Navy restarted the Arleigh Burke program, Bath Iron Works had to relearn how to build the older style of destroyers with their new systems. “It’s got to be a gut punch to invest as much as (BIW) did in that yard to only build three at the end of the day. That’s hard to recover from,” Hooper said. But even as BIW moved forward with building a limited number of Zumwalts, it wasn’t clear how the Navy would incorporate the ship into the fleet. In late 2017, the Navy announced that it would be shifting the Zumwalts’ purpose from operating close to shores and supporting troops on the ground to attacking other surface ships. According to the Navy’s 2019 budget request, it will cost an additional $89.7 million to convert the destroyers to suit their new mission. When the Navy announced the change in priorities in 2008, it stated three main goals for destroyers: anti-submarine warfare, countering cruise missiles that could hit ships, and ballistic missile defense. All three of those missions could be fulfilled by the far less expensive Arleigh Burkes, begging the question: What exactly had the Navy gotten for its $23 billion Zumwalt investment? The Zumwalt destroyers were always going to be expensive. They featured about a dozen new technologies and a completely new hull design – none of which came cheap. But what really increased the cost of each ship was the decision to drastically reduce the total number of Zumwalts to be built. With only three ships to build, contractors couldn’t take advantage of economies of scales. This can be seen most dramatically in the proposed ammo for the ships’ advanced gun systems. Originally, the ammo was priced in the range of tens of thousands of dollars per round, making it expensive but not unusual for the Navy. But with only three ships sporting the only guns capable of firing the custom-built ammo, the manufacturer could no longer take advantage of economies of scale and the price skyrocketed. The Navy canceled its order when the per-unit price grew to more than $800,000. A similar thing has happened with the Zumwalts as a whole. Normally when the Navy adds a new ship to the fleet, the costs of research and design can be spread out over 20 or even 30 ships. Since the Zumwalt class was just three ships, those significant costs were divided between just the three vessels. The Zumwalts are already expensive – they cost $4.6 billion each compared to about $1.8 billion each for an Arleigh Burke. But when you add in research and design costs, the cost rises to more than $7 billion for each Zumwalt. Even if the three destroyers are effectively incorporated into the fleet, are they worth the money? As of Saturday, two of the Zumwalts have been commissioned, and the third is floating dockside at Bath Iron Works. The ships are here, so how does the Navy make the most of them? For both Hooper and Wertheim, the key value of the Zumwalts moving forward is their use as a platform for testing new technologies that can be incorporated into the rest of the fleet. The ships already have demonstrated the effectiveness of some impressive new technologies. The ships show up as just a fraction of their 610-foot size on a radar, thanks to their stealth design. Their all-electric propulsion system is a first in the Navy, and could very well be adopted in future ships. Under questioning from Republican Sen. Susan Collins of Maine last year, Adm. John Richardson, the chief of naval operations, told her and other senators that the Zumwalts’ technologies would inform future ship designs. In addition, the destroyers are ripe with possibilities when it comes to testing out new technologies. “From the beginning, it was designed with room for experimentation and improvements,” Hooper said, pointing out that because Zumwalts are larger than Arleigh Burkes, there’s more space to try out new tech. Some of the proposals for the Zumwalts come straight out of science fiction. Though the technology is far from mature, Navy experts speculate the Zumwalts’ ability to generate massive amounts of electricity could allow it to use rail guns or even laser weapons in the future. Hooper noted that the technology angle makes it difficult to write off the Zumwalts completely. After all, if the right piece of technology is installed and transforms the ship substantially, it could become an effective asset in a way that can’t be predicted.